Did you read the news? The Vatican caved in! No, wait, the sisters caved in! Or did they both win? Well, something happened! Of course, headlines sell newspapers—or, more accurately, drive traffic—so the headline of Allen’s piece avoided the whimper and went for bang: “Why the Vatican’s crackdown on nuns ended happily”. The Vatican has unexpectedly ended its controversial overhaul of the main umbrella group of U.S. nuns, cementing a shift in tone and treatment of the U.S. sisters under the social justice-minded Pope Francis. There are, however, several ways of skinning the controversial Catholic cat, as Reuters reporter Philip Pullella makes evident in a piece titled “Activist U.S. nuns make concessions after Vatican investigation”. Instead of reconciliation, Pullella apparently smells capitulation and oppression. And guess who the Bad Guys are? A six-year row between activist American nuns and Vatican officials who had branded them radical feminists ended on Thursday with the nuns conceding to demands that they keep within the doctrine of the Roman Catholic church. The clash with the Leadership Conference of Women Religious (LCWR), an umbrella group representing 80 percent of U.S. nuns, became a national issue in America, with many supporters accusing the Vatican of bullying them. 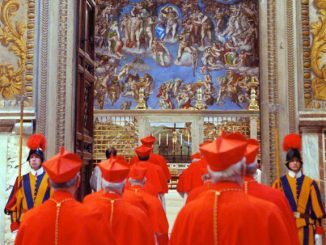 The Vatican investigated the group for three years and then in 2012 issued a stinging report saying the LCWR had “serious doctrinal problems” and promoted “radical feminist themes incompatible with the (Roman) Catholic faith”. Goodness! It’s as if the sweet little nuns had been doing nothing but putting band-aids on skinned knees and singing sweet, lilting songs of sisterhood when—wham!—those nasty guys in Rome went all patriarchal on them. Of course, the truth about the history of the LCWR and its various actions in recent years suggest a rather different story. But I don’t expect Reuters to tell it. The New York Times says a “battle” has ended, Seattlepi.com says the “the nuns stand tall”, and Slate claims the Vatican tacitly admitted the entire matter was a waste of time. Slate demonstrates its tenuous grasp on the story by illustrating it with a photo (see below) of habit-wearing youthful members of Sisters of Life—an order that belongs to the Council of Major Superiors of Women Religious, not the Leadership Conference of Women Religious (LCWR), which is the (aging) body in question and which is not known for wearing habits (see photo above, thank you). For those not versed in these matters, it is analogous to illustrating a story about a Hillary Clinton campaign stop with photos from a Tea Party convention. The Vatican brought to an end a three-year overhaul of a U.S. nuns’ group stemming from a controversial investigation that found the sisters had neglected church teachings on abortion and other issues. In a final document released Thursday, the Vatican went lightly on the nuns, effectively sparing them from any sanction or further oversight. The outcome represented a markedly more conciliatory tone in a controversy that saw the Vatican widely criticized for its treatment of the sisters. His title? 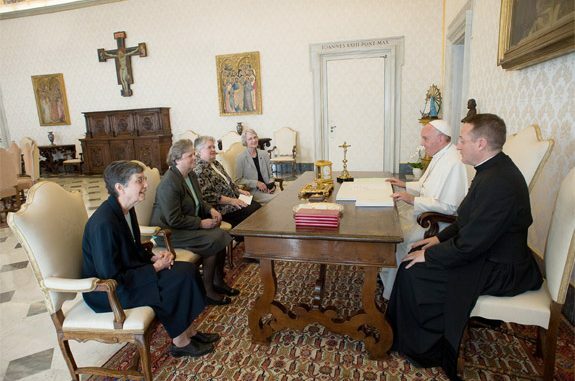 “Vatican Ends Overhaul of U.S. Nuns’ Group”. One final thought: Are matters with the LCWR really resolved—with a whimper? Maybe. Frankly, I doubt it. I have a hard time believing that a group whose leadership has thumbed its nose at the CDF and bishops and has so often ignored (or even denied) Church teaching is going to so suddenly change its spots. I’d like to be wrong on that count. But, time will tell. In the meantime, let’s hear it for more truth in headlines and the stories beneath them.